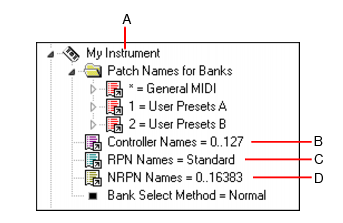 Cakewalk lets each instrument have its own lists of controller names, RPN names, and NRPN names. There is always exactly one list of each type per instrument. Expand the instrument definition by clicking the PLUS (+) sign next to the instrument name. In the Names tree, expand the branch containing the Controller name lists, RPN name lists, or NRPN name lists. Drag the desired name list from the Names tree onto the corresponding branch of the Instrument tree. Cakewalk displays the updated Controller, RPN, or NRPN name lists.